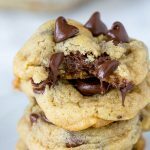 Butterscotch Pudding Triple Chip Cookies – Super soft and chewy butterscotch cookies with three kinds of chocolate! 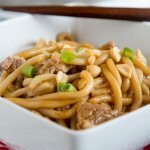 So easy to make, and definitely a hit! Cookies are always a favorite. If you tell someone you are making cookies, they instantly get happy and want to know what kind. 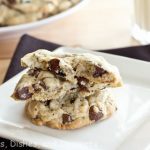 It can be the Perfect Chocolate Chip Cookies for a classic, or something new! Pudding cookies are a really great way to get thick cookies that stay super soft. 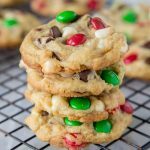 Double Chocolate M&M Cookies are one of my favorites, because they taste like your favorite chocolate chip cookies, but stay soft and the texture is just perfect. My husband is not a fan of chocolate. He is more of a creme brulee kind of guy. So sometimes I have to mix it up when I am making desserts. He loves butterscotch though. It is not used in nearly enough desserts!! Butterscotch blondies are one of his favorites, and I don’t make them nearly enough. So butterscotch cookies seemed like the next step. And to make everyone happy, I added in 3 kinds of chips! Chocolate chips, white chocolate chips, and then butterscotch chips. Doesn’t get much better! 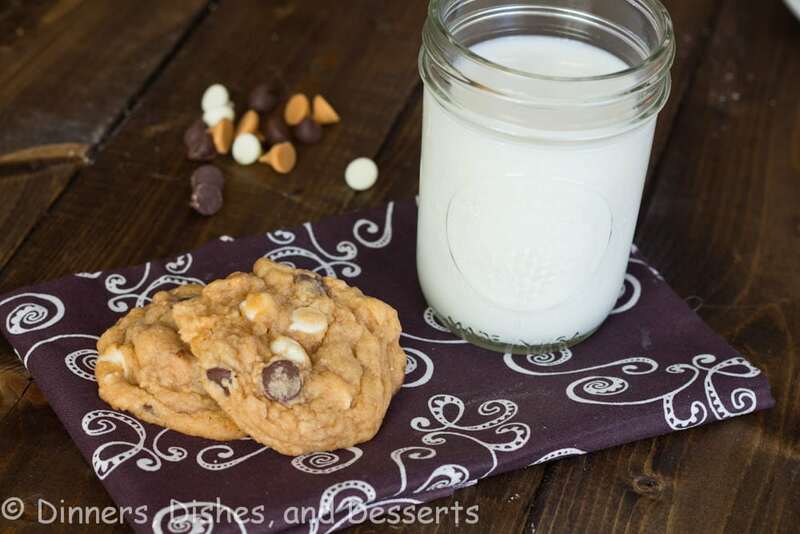 These Chewy Oatmeal Peanut Butter Butterscotch Cookies look like another favorite! Pudding cookies are great because you can mix up the flavor however you want. You have chocolate pudding? 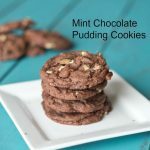 Then make these Mint Chocolate Pudding Cookies. Or these Snickerdoodle Crunch Pudding Cookies would be a huge hit with my family as well! You can take the concept and make them a bunch of different ways for whatever your family likes! These are pretty much a staple in our house. Butterscotch really needs to be in more desserts. 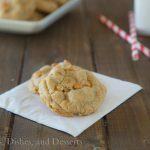 But I have to say these butterscotch cookies should be added to your must try list! One unexpected thing to pair butterscotch with is peanut butter. These Butterscotch Peanut Butter Butterscotch Rice Krispie treats are dense, fudgy, and so good. They will disappear just as fast as these butterscotch cookies. Or go completely out on a limb and make Butterscotch Apple Cake Donuts. 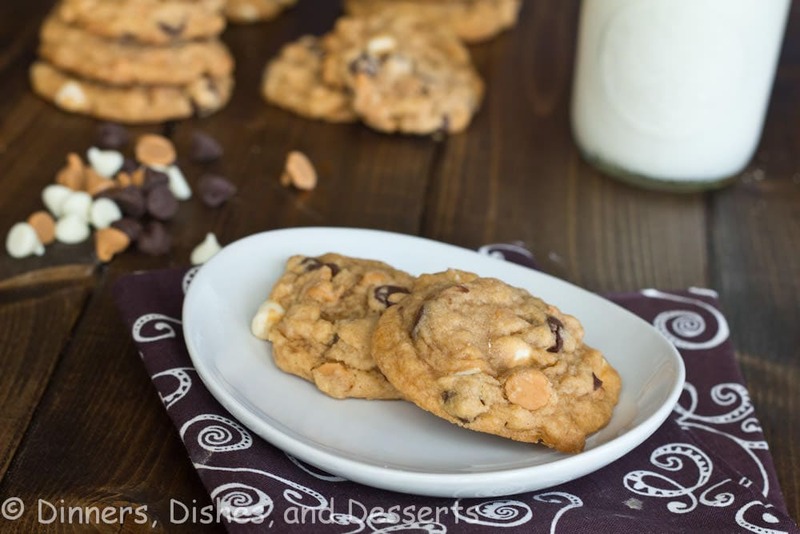 You can have those for breakfast and these butterscotch chip cookies for dessert! 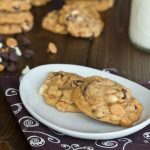 Super soft butterscotch flavored cookies with three kinds of chocolate! Preheat oven to 350 degrees. Prepare a baking sheet with parchment paper or a silpat linear. In the bowl for an electric mixer, combine the butter, brown sugar, and sugar. Beat until light and creamy. Add the pudding mix, eggs, and vanilla. Mix until well combined. Add flour, baking soda and salt. Mix until just incorporated. Fold in all the chips. Scoop small balls of dough (golf ball size) on to the prepared baking sheet. Bake for 10 minutes, or until the edges are slightly golden brown. Allow the cookies to cool for a few minutes on the baking sheet. Remove to a wire rack to cool completely. 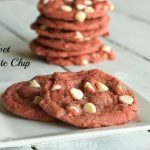 Previous Post: « Pink Velvet Cookies & a GIVEAWAY! I need to make a batch of these to send in a care package. 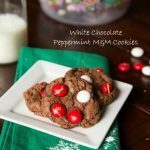 This is a great recipe, and they make a great gift! Have a nice sunday! My husband is a huge butterscotch fan too. He would love these cookies! I haven’t thought about butterscotch in a long time. Now I’m missing it and can imagine how tasty these cookies must be. 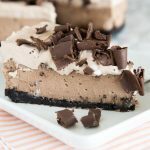 I have heard about adding pudding to cookie mix before – this recipe sounds fantastic! Butterscotch and chocolate are such a yummy combo! I’ve never used pudding in a cookie! Now I can’t wait! I LOVE BUTTERSCOTCH! I cannot stress this enough hehehe. Your cookies look unbelievably good! Pudding in a cookie? Inspired! Awesome recipe. Thanks for helping to spread the word, Erin! Yow-za, chip overload, but I’m not complaining! Love a rich cookie, especially on Sundays, while watching sports 🙂 Feels like I’m burning all the fat anyway 🙂 LOL! I’m having a cup of coffee right now and these cookies would be just perfect with it! One of my friends swears by her chocolate chip cookies with a box of pudding added to the dough. Maybe it’s time I try this out, too! Your cookies look marvelous….but I DO love ALL your cookies! Happy #SundaySupper! Wow do these sound great! Add to my Christmas Cookie list! Triple chip cookies are my kind of cookies! 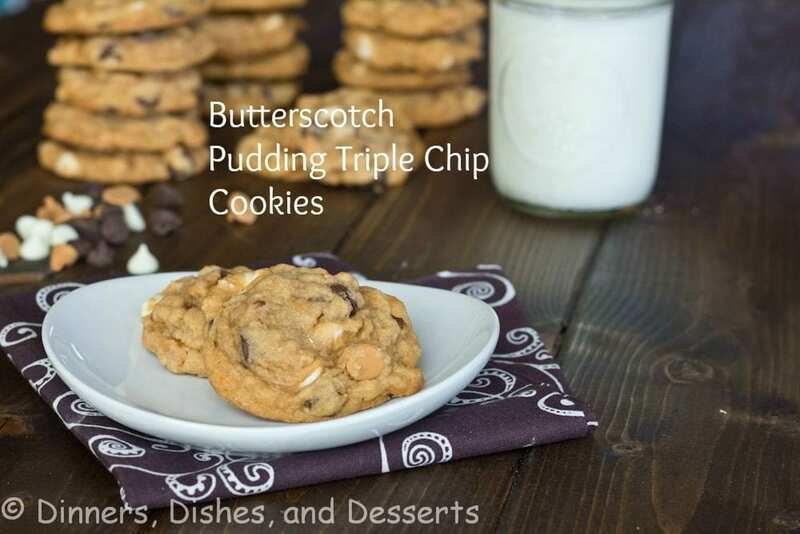 I cant wait to try these I love anything butterscotch! I think I could easily eat the entire batch! They look irresistible!! Oh my goodness. I love the flavors going on in these cookies. I will be making these for Cookie exchange! I know these are awesome because I thought I made up this triple chip idea myself 2 days ago when I made chocolate chip cookie dough with white chocolate, butterscotch, and mini chocolate chips. I love the idea of pudding the butterscotch pudding in it! I put that into banana bread with butterscotch chips, but I’ve never tried cookies. These cookies sound so good. I haven’t tried pudding yet, but I love when cookies have multiple mix ins. Love the idea of the triple chips! My son LOVES butterscotch! Since a couple of years ago though, he has been unable to process dairy, and many of the puddings/etc have pudding in them. I’ll have to see what I can find, as I’m certain these beauties would attain a high status in his cookie world! I’ve never used pudding mix in a cookie before but you’ve got me sold with your description of the magical things it does. 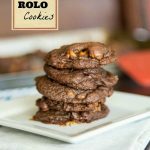 These cookies look perfect and you can’t go wrong with a combo of butterscotch and chocolate! 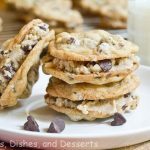 I’m making these– love pudding in cookies! oh my! these are loaded! perfect cookies. 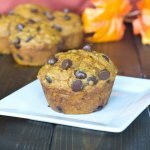 These sound delicious and incredibly sweet! You could get a totally different flavor throughout the cookie depending on which chips end up in each bite. Yummy! These sound divine! I bet with the pudding they are super moist and the flavors are amazing! you had me at butterscotch pudding in a cookie. Yummy! Sounds pretty fantastic! These cookies look so good. I’ve never had pudding in a cookie, but I bet it does taste awesome. I love these cookies!! I don’t bake with butterscotch nearly enough! I will take 2 dozen please! I LOVE your idea of adding butterscotch pudding! This is definitely on the Christmas cookie list! Mmmm! I LOVE butterscotch 🙂 Your cookies look fantastic! Those sound awesome! I love all the chips in them!!! Do you have to use instant pudding? Or would butterscotch heat and server pudding work as well? The grocery store I just went to only had 1 oz. packages of sugar free butterscotch instant pudding or 3.4 oz package of heat and serve butterscotch pudding. Any suggestions? I honestly am not sure what the difference is with the heat and serve vs. instant. So I don’t know if it would work. You are only going for the flavor, so honestly I am not sure why it wouldn’t. Otherwise, I would just use one box of the sugar free. You will be able to taste the dough to tell if it has enough butterscotch flavor, so you could always add another box if it didn’t. Hope that helps! I absolutely LOVE butterscotch and you’re right, it is not used enough by far! 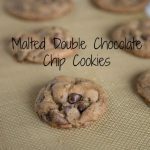 I never thought to use pudding mix for cookies but what a perfect ingredient and offers such a variety! 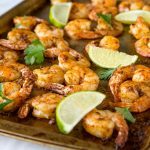 The 3 kinds of chips in this recipe are awesome but I think I might need to try all the suggested recipes in this post!!! These have my name all over them! Cookies with pudding in the mix are my favorite! The texture is perfection! This is the ultimate cookie. OH my goodness!!! This is absolutely amaaazing!! YUM!! wow these cookies look so so so soooooo good! 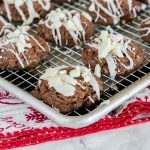 Whoa these cookies are amaze-balls! Love anything with butterscotch! And triple the chips doesn’t hurt either! Those sound terrific, I’d love a couple of them right now! Love that you triple downed on the butterscotch flavor! This looks so good! I want to grab one right now! I want to try those cookies! They look fabulous!